Known as Dr. Death even before launching his fierce advocacy and practice of assisted suicides, Kevorkian, 83, died at Beaumont Hospital in Royal Oak, where he had been hospitalized with kidney and heart problems. His attorney, Mayer Morganroth, said it appears Kevorkian suffered a pulmonary thrombosis when a blood clot from his leg broke free and lodged in his heart. With Kevorkian was his niece Ava Janus and Morganroth. “It was peaceful, he didn’t feel a thing,” Morganroth said. Kevorkian was a disturbed man who, I fear, understood his society — and the media — all too well. And that may be his legacy. He perceived how far some will bend to rationalize even the most egregious wrongdoing or advocacy if the excuse is relieving suffering. Time will tell if he was also a prophet of a dark utilitarian society to come. 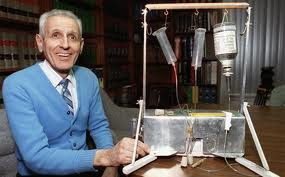 What is the proper response to the death of someone like Kevorkian? We should, at least for the moment, set disputes aside and hope that in whatever comes next, he finds forgiveness and peace. In this regard, Kevorkian was a death-obsessed atheist who zealously believed that when he died — nothing. He now knows (or doesn’t) whether he was right.